I have spent time in Belgium, of course. You can’t be a cycling writer for three decades and not spend time in Belgium. But I hadn’t ever been there for the kind of sustained period that is required if you want to begin to get your head around a country. I say “begin” advisedly because the only way you can really understand a country is by living there. So last week was the second of three blocks of time I will be spending in Flanders this year. So what did I learn? Quickstep are dominant, and they look to me like Peter Post’s TI-Raleigh/Panasonic did in the late 1970s and early 1980s, based around versatile one-day racers – Raas, Gerrie Knetemann, Cees Priem and Ludo Peeters – rather than the most highly priced icons in the firmament, with a philosophy of “total cycling”, having numbers up front to dominate the finale. At Quickstep Tom Boonen’s retirement has left space, established names like Niki Terpstra, Zdenek Stybar and Philippe Gilbert are as good as ever, and Yves Lampaert has hit the boil at the right time. The clincher is probably this: Quickstep don’t have a rider who can win a Grand Tour, which frees up budget for riders worthy of leadership at another team, and it also frees up team slots and budget for one-day riders and development riders because there is no need for a train of climbing domestiques. The other teams simply cannot cope with the numbers Quickstep can field in the back end of a one-day race, unless they have the sprint skills Peter Sagan showed at Ghent-Wevelgem. The main thing I was reminded of last week was the extent to which cycling is imprinted in the fabric of Flanders. Every village has a race whose name you recognise, or a statue of some long-forgotten star, or a mural of some great race, or a bar that proudly proclaims itself the home of a fan club. Every industrial estate has names you know from jerseys past and present: Collstrop (wood things for gardens), the KBC bank, Willy Naessens building products, and so on. I hadn’t seen the new format Tour of Flanders before, and was duly impressed. 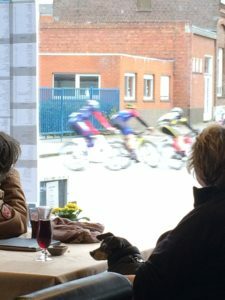 It has mushroomed into an absolutely immense event – what sprang to mind when beetling around the Ronse/Kluisbergen area on Sunday was the Cheltenham Festival, a vast number of sports fans in a fairly confined area, putting away an epic amount of alcohol while watching top class sport. But it was still totally recognisable as the bike race I last saw in the mid-1990s; it has grown exponentially while sticking close to what makes it unique: that particular region between the N36 Ronse highway and the Schelde river, the succession of cobbled hills. I loved the old route with the Muur and Bosberg at the back end, but this latest version works for me. In the style of Jock Wadley, I managed a couple of lengthy days out on the bike for research purposes: a long trip west to Ypres and the Kemmel to remind myself of how Ghent-Wevelgem slots into the World War I battlefields, and a decent schlep north to Torhout to watch an amateur kermesse, where intriguingly around a third of the 175 riders were from Scandinavia. And again, you are reminded of the basics of Flemish cycling: a tight circuit – three miles in which there was a small berg, a bit of crosswind, and some tight corners – which crucially took in a couple of strategically placed bars, with enough time to buy a round of beers while you wait for the bike riders to pass, as Jo Parkin wrote in A Dog in the Hat. So four bike races in a week to watch in different ways. Ghent-Wevelgem in the same bar on the Kemmel that I wrote about for Cycle Sport in 1997, Dwars door Vlaanderen in the press room, because it wasn’t a day to be outside, and luckily in pure racing terms it was the best of the four, the kermesse riding the wrong way round the circuit as you would with any amateur event, and Flanders again on the bike, scooting between viewing points around the Kwaremont. All without the pressure of having to knock out a few hundred words afterwards. And that was a reminder of something else as well: I just like watching bike races for all the reasons any fan can understand, I always have done. It was good to feel that passion refreshed.